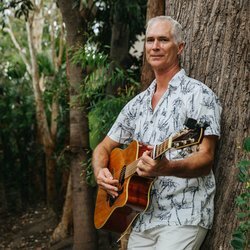 Maynard Heap is a versatile, solo, harmonica, guitar playing, singer-songwriter, who shares a diverse range of songs from his recently released debut album, Nurtured In The Wild. His distinctive, self-taught style has evolved with his musical journey throughout Queensland. He has been performing at the Woodford Folk Festival, with the Steven Hart Band, since 2004. His solo works are sometimes insightful, often funny, uplifting, virtuous and inspiring. Maynard’s arpeggio picked and strummed acoustic, electric and slide guitar, provides a solid foundation for his resounding vocals and either his melodious harmonica or bluesy cross-harp to weave its spell. His repertoire covers elements of folk, country, blues and rock. The lead single In Control is released 12th April, Think Globally, Act Locally 26th April, Reflection 10th May, in support of his twelve song debut album, Nurtured In The Wild 24th May. This solo original work by singer-songwriter Maynard Heap covering themes of youth direction, self-control, mentoring elders and community responsibility is insightful, uplifting, virtuous and inspiring. Maynard’s arpeggio picked and strummed acoustic, provides a solid foundation for his resounding vocals and bluesy cross-harmonica to weave its spell. It is the lead single of his debut album, Nurtured In The Wild.